The newest EV charges fast and seats around 68 passengers. It’s Proterra’s electric bus. The electric vehicle tipping point might come from slow, sensible buses instead of sleek EV sports cars or sedans from the likes of Tesla or Fisker. Proterra, a maker of electric municipal buses and fast-charging systems, raised $23 million from new investors Hennessey Capital and NMT Capital, along with existing investors Kleiner Perkins Caufield & Byers, GM Ventures, Mitsui & Co. Global Investment, 88 Green Ventures and Vision Ridge Partners. This follows a $30 million infusion in June of last year. The company is delivering electric buses to transit agency customers and growing fast in the immense global transit market. Proterra has 170 employees today, up from 37 in June of 2011. Buses drive fixed routes at moderate speeds, so they're an ideal application for electric vehicles. According to the David Bennett, Proterra’s CEO, 85 percent of city bus routes are less than 30 miles. A Proterra bus can completely rapid charge in ten minutes or less on route -- so, there is zero range anxiety and little requirement for behavioral change. The relatively predictable short distances traveled lets Proterra minimize the size of the battery pack -- with battery packs in the 54-kilowatt-hour to 72-kilowatt-hour range. The Tesla Roadster has a 53 kilowatt-hour pack. 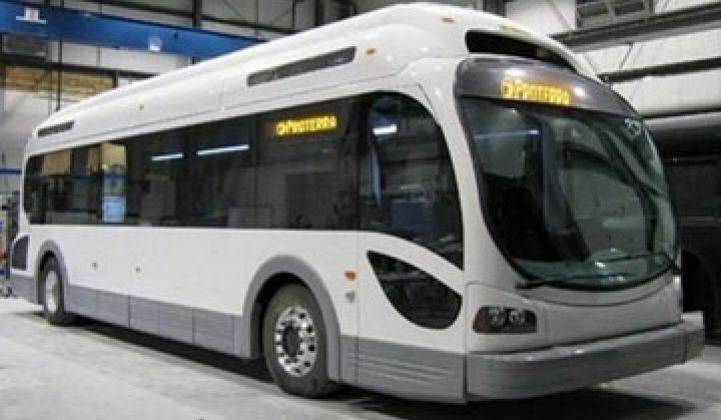 Proterra’s CEO told us that the firm looks to ship between 40 and 60 buses in 2013. Proterra's buses are priced higher (at about $900,000) compared to conventional buses (at about $500,000) but Bennett sees his firm's price coming down to $800,000 as volumes rise. Plus, the EV buses save $50,000 per year in diesel costs, according to the CEO. Proterra designs and builds, with a lot of outsourcing, the entire bus including the electric drive, energy storage system, vehicle control systems, and fast-charging stations. The firm uses lithium-titanate batteries from Altair Nanotechnologies (Nasdaq: ALTI) for its safety and charging characteristics. Altair had Q3 2012 revenues of $0.4 million compared to $0.9 million in Q3 2011. The firm makes use of carbon fiber and low-weight materials when it can. Regulations and policy can help Proterra grow -- California has zero-emission requirements on a portion of buses purchased by municipal agencies and there is $50 million in a new Highway Bill directed toward EVs. An older GTM article describes a test drive we took in 2009 with a Proterra prototype as "smooth, quiet...and just like a regular bus but no fumes or noise."